Deals massive direct damage to enemies in a forward-facing fan-shaped area (maximum 3 targets) and reduces current target’s march speed for the next 2 seconds. At max level, all of three targets could get hit by 750 damage direct damage factor and also get the marching speed reduction. This is definitely a great skill especially when you are doing a Lost Temple for those Believers. Sandstorm is a very unique skill because of this marching speed reduction. Baibars is the first Epic commander that has this ability so far. When you’re in a battle and your enemy tries to retreat, they ain’t running back fast! 30% decrease of the marching speed is a lot. It’s only for 2 seconds by the way, meaning about 2 turns that would this take effect. Increases attack of cavalry units. Before you guys even upgrade this or unlock the skill, make sure the sandstorm skill is already maxed out to level 5. This skill is pretty simple and easy to understand. It’s just going to increase the cavalry attack bonus by up to 20%. When attacking cities, normal attacks have a 100% chance to decrease garrison attack and defense. Garrison is the troops defending the city. Their attack and defense are going to decrease by 7% at the max level. This is a very useful skill and it is complementing super well with some of his talents in the Conquering. Upon leaving battle (But not when routed), heals a portion of slightly wounded units (Healing Factor) and increases march speed for the next 10 seconds. When he’s not retreating (he actually wins the battle) he’s going to be able to heal the slightly wounded units with the healing factor of 200 at max level. When you heal the wounded units them, they’re gonna go back to the main army and they’re gonna be able to participate again. So this is a good skill because it’s gonna help you last a lot longer in the battlefield. Also, for 10 seconds, you can march really fast, up to 50%, so you can chase the enemies after you win the battle if there’s another enemy or you can retreat fast. So you this is a very useful skill. This skill is going to enhance the Active skill Sandstorm. You can unlock this skill by unlocking all of other skills have them all max at level 5. It increases the damage factor of the Sandstorm from 750 to 1000, the maximum targets from 3 becomes to 5 and the target’s marching speed reduction from 30% to 50%. This is just so good. Your target’s marching speed is going to be really slow, up to 50%, whenever they want to retreat. They can’t run away from you. This is awesome. When you’re using Baibars for like Lost Temple, you’re gonna slow down those Believers a lot so that they can’t get into the Lost Temple for healing. This helps you save tons of times. 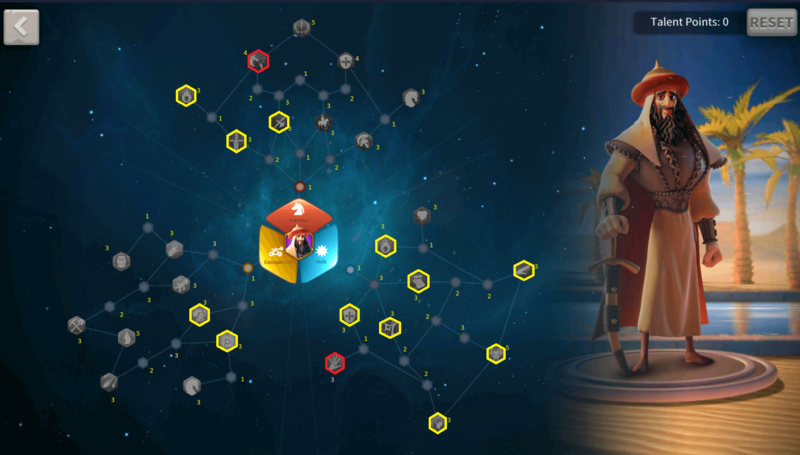 This talent build is more of a Conquering one so when you are trying to attack other cities, this is the talent for you. So this is based on the conquering talent path. 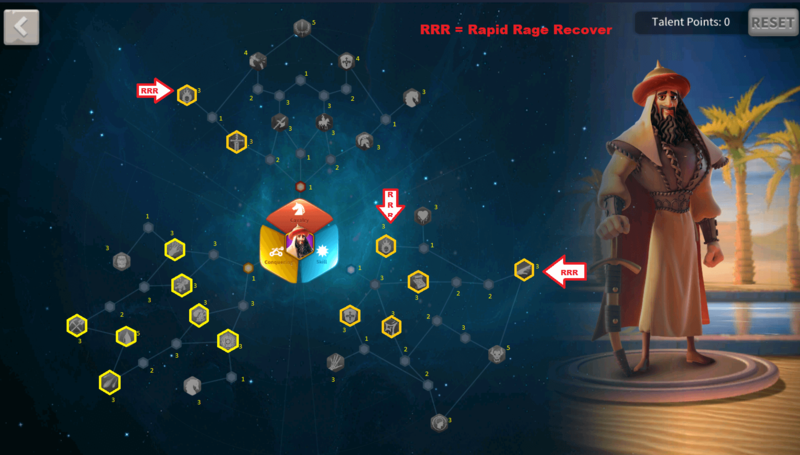 Also make sure that you add these skills to gain some Rapid-Rage-Recovery (RRR), allowing you to gain a lot of rage and activate those active skills more frequently so that you can maximize his nuking capability. 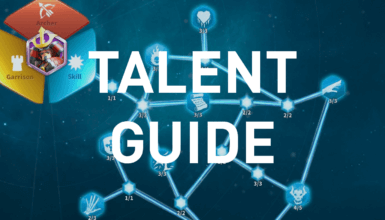 Here’s another talent guide option for you guys which focus on the Skill path first. What it does is going to really enhance that Rapid Rage Recovery for Baibars. Also, check out the red nodes once you filled up all the yellow nodes. First you want to get that Rejuvenate because it’s going to instantly restore 20 rage whenever he uses skill. And also you’re going to gain 3 rage for every normal attack from the Burning Blood talent. Complete the Skill path first, you can either work on your Conquering or the Cavalry path next. The Cavalry path has the Undying Fury talent that gives 3 additional rage for every normal attack, which is similar to the Blooding Blood. So we’re maximizing the Rage Recovery for him so that Rapid Rage Recovery system you really need to emphasize on that when you’re leveling up commanders like this. Buckler Shield: Reduces counter attack damage taken by 3%. This is not specific to attacking Governor City. Moment of Triumph: While the enemy led by this commander is at more than 90%, increase all damage dealt by 3%. Entrenched: Reduces damage taken from Garrison by 2%. Remember that Baibars has attack reduction 7% and defense reduction 7%. It’s basically gonna make their attack a lot weaker. So let’s go ahead and talk about commander pairings! The first thing that it really comes out of my mind is using Cao Cao. I’m definitely gonna I can use Tao Tao as the Primary Commander and then Baibars as the Secondary Commander. The marching speed reduction of Baibars and Taotao matches perfectly. Using Tao Tao, your attack reduction for the enemy is going to go down a 40%. Tao Tao has a massive nuking capability here this damage factor of 1400 and then also the Cavalry bonus. He also has a healing factor. He heals in the battlefield and when you step out of the battlefield you also gonna get some heal from Baibars as well. Couple him with Sarka or Gaius as they have the marching speed reduction. It’s a little bit to use Gaius Marius for that, being lead by Baibars. The strategy behind this is when you’re trying to attack those believers, this combination is really beneficial. Because when the believers get into the last temple, they’re gonna heal that lost temple and you don’t want that because it’s a waste of time. Pelagius already has that cavalry buffs here and also he has the healing so he’s gonna heal in the battlefield and then when you get out of the battlefield you’ll have Baibars to heal the lightly wounded units so it’s a win-win situation. It’s better to lead with Pelagius because you can have that rage restoration. 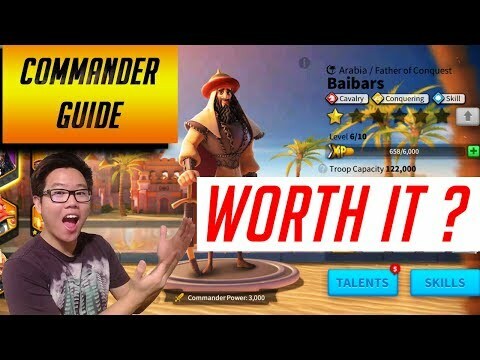 Baybars is definitely worth it to invest, especially if you’re new to the game and you are just starting out with your kingdom progression. This is because you can use Baibars for lost temple with that marching speed reduction. Being an Epic Commander, having the marching speed reduction is very awesome, especially if you can’t get Cao Cao. Also, with the healing that he has after he gets out of the battle, you’re gonna heal your slightly wounded units early, helping you stay much longer when farming Barbarians and neutral units.